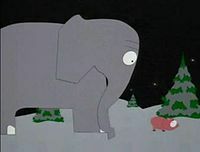 South Park Episode 105 - "An Elephant Makes Love to a Pig"
"An Elephant Makes Love to a Pig" is the fifth episode of Comedy Central's animated series South Park. It originally aired on September 10, 1997. In this episode, Stan gets repeatedly beaten up by his sister Shelley. Meanwhile, Kyle cannot keep his elephant, as it is too big. As a result, he turns to Mr. Mephisto in order to crossbreed his elephant with Cartman's pig Fluffy. At the genetic engineering lab, Mephisto steals some of Stan's blood, which he then turns into a clone of Stan for his relative Terrance Mephisto, who made a bet with Kyle. However, the clone breaks out and wrecks havoc on the town. After Mephisto shoots the clone, Shelley, in a rare moment of empathy, takes the blame for Stan. 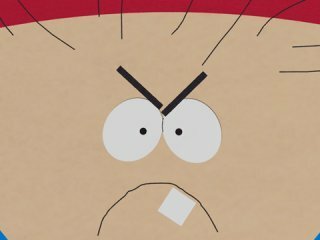 This episode was written by founders Trey Parker, Matt Stone, as well as writer Dan Sterling. Despite controversy surrounding the originality and crudeness of the episode, many reviews praised the episode as being able to address such issues of engineering and the possibilities of its power. In addition, Dr. Mephisto marked his first appearance. The character was based on a character in the 1996 film, The Island of Dr. Moreau.